Is this the most moderate cycling forum? My other favourite web cycling stop is road.cc, generally well written articles and a decent amount of updates, however I'm really starting to take issue with the 'militant' cyclist attitude it seems keen to promote. Quite an amount of stories on their main page are about yet another cyclist being injured or reporting on HGV accident statistics yet not once can I recall there being a 'ride safe' article. Over in the forum they are all a pretty decent bunch until anything suggesting cyclists may be at fault rears it head then the motor-vehicle hating really starts! Obviously this forum being on PH is far more moderate in relation to motor transport but some of their attitudes make even the most anti-cyclist poster in GG look tame! You get a bunch of car-haters on bikeradar. Seems there are a lot who want to have the same rights as cars while behaving how they like on the roads. I browse CTC also but just have to bite my lip when a thread starts with "I appreciate that no-one here votes conservative...". There was another thread about washing (or lack of) with one guy saying he had a bath at most once a week and never used deodorant. No one in his office complains though. possibly because this is fundamentally a motoring forum we are somewhat less blinkered by the militant cyclist mentality and can appreciate the issues from a motorists perspective? Having recently gotten into cycling, and loving (almost) every minute I spend on a bike, Internet forums are fast teaching me that some staggeringly awful human beings are cyclists. Pistonheads - Moderate, not something you hear everyday ha ha. But yes, in this instance, I'm not a road riders so rarely venture to those parts of the web, but it seems that a very vocal minority seem to think they should be free ignore whatever laws, sections of the Highway Code or common decency they feel they want to, whilst on the other hand are hyper militant about any other road user. I have a particular dislike for the type who wear helmet cams for the sole purpose of trying to get themselves hurt in order to vent their righteous indignation to film. Of course there are drivers, truckers, van drivers, bus drivers, pedestrians and of course bloody horse riders and motor bikers who are just as bad. Depends which sub-forum on BR you go onto. 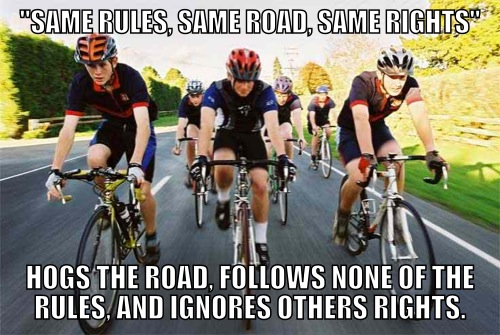 There are a fair few riders on BR who have next to zero tolerance for the "all drivers are b ds" brigade of cyclists. Now, if it's militant Sir wants, may I suggest Sir wanders over to lfgss.com. The standard response to a car driver over there seems to be "D-lock the !". That's a pretty good way of summarising the world in general, really No matter the occupation, no matter the hobby, there are decent chaps and there are horrific ones. I know. Agreed. I'm always arguing that X people arent knobs, just 'people' are, generally speaking, knobs! Mind, some hobbies do endear themselves to a certain brand of tw^t. Do you know what really pisses me off? No? Well, I'm going to tell you. Internet Memes with grammatical errors. Absolutely drives me nuts. What about those with inappropriate capitals? Road bikes and peaked helmets, that's awful! This is one of the nicer forums around, Cyclechat is ok too..
Dont try 'London Fixed gear and single speed forum', unless you like being slagged off, militant to the n'th if you dont suit their self-righteous 'vibe'. Yes, this is certainly one of the nicer / more moderate cycling forums around, I really can’t be doing with the militant types that populate certain other sites. Like most posters I found PH by primarily being a car nut, but as someone that also enjoys two wheels discovering that it also had a fairly active cycling forum was a pleasant surprise. Really looking forward to getting my mitts on the PH jersey - just need to hunt out my chequebook this weekend. Without sounding boastful, we are probably better road users than the bulk of the population. We like cars and bikes and so when we ride, we can empathise with the cars around us and behave accordingly and when we drive, empathise with the cyclists. Agree with this - there's a real lean towards cars on this site, so it tempers any radical thoughts against motorists. Yu often get the usual one eyed comments about cyclists (not paying road tax, jumping red lights, camera nazis etc), but most people also realise these are stereotypes, and there are bad road users in all categories.